CIRCA’s current projects in the area of inland flooding are listed on the Inland Flooding Projects & Products site. There you can find a description of ongoing projects and any products from the project, including tools, reports, data, presentations, etc. Below is a general description of inland flooding issues. CIRCA works to enhance the State’s resilience to inland flooding. CIRCA focuses on understanding characteristics and trends of changing precipitation patterns and their influence on inland flooding in riverine communities using tested hydrologic models. In coastal areas where there are also rivers, rainfall contributes to flooding in coastal communities as well, packing a one-two punch. The 2014 National Climate Assessment (NCA) finds that hurricane intensity and intense rainfall events will increase as the climate continues to warm, both contributing to inland flooding. The NCA also states that “river flooding occurs when surface water drained from a watershed into a stream or a river exceeds channel capacity, overflows the banks, and inundates adjacent low lying areas. Riverine flooding depends on precipitation as well as many other factors, such as existing soil moisture conditions and snowmelt.” Clearly as the climate continues to change and heavy rainfall events continue, it is expected that riverine flooding will also become more frequent. 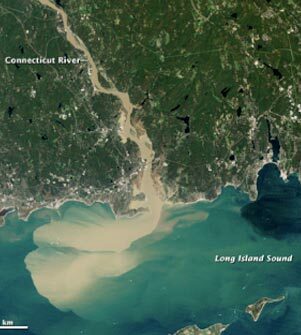 Moreover, research (ASCE Magazine, 2015) indicates that riverine and coastal flooding events are occurring simultaneously much more frequently than they were half a century ago, contributing to a compound impact of coastal communities with rivers. CIRCA’s work in this area includes the development of a hydrologic model that takes into account all of the river flooding factors described above with environmental conditions that are specific to Connecticut. This model can be used to predict future flood conditions in riverine systems for the state. Furthermore, the riverine flooding can be combined with CIRCA’s coastal flooding information to determine the compound impact of the two sources of flooding. Information from CIRCA can be used to determine whether Connecticut’s current and future flood control structures are designed for these scenarios and to identify areas and infrastructure at extreme risk. U.S. Global Change Research Program. 3rd National Climate Assessment. Washington, DC, US 2014.